American Barbell Urethane Fractional Olympic Weight Plates in Kilograms - Fractional Plates from American Barbell are urethane coated Olympic plates designed for smaller incremental weight jumps during Olympic weightlifting, powerlifting, and technique training. Fraction plates, also known as "record breakers," are a valuable micro-loading tool for progressive strength training to overcome plateaus, learn technique, reach the next level in strength gains, and increase your personal best. 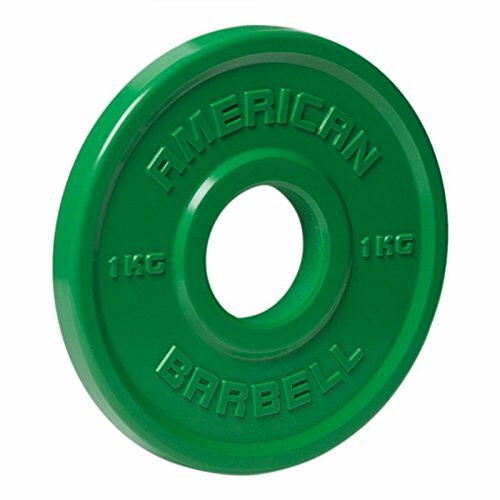 American Barbell Fractional Plates in Kilograms are covered in hard-wearing, German urethane. Rubber coated plates have a tacky feel, can have a bad odor, can fade in color, and can split or tear over time. Once a rubber coating is torn open, the metal core beneath is more susceptible to rust and risk of breakage. Urethane, by comparison, is the most durable coating for an Olympic weight plate. Urethane has no odor, and its surface is smooth and glossy making it easier to keep clean. Urethane will not split at the seams, tear open, scuff off, deteriorate, or discolor from sunlight or bright UV lighting. American Barbell Urethane Fraction Plates are coated not just around the plate but also within the center hole so that they will not scratch bar sleeves coated in hard chrome, stainless steel, or black oxide. Because there is no exposed metal, Urethane Fractional Plates will not rust and are great for outdoor training and garage gyms. This center hole urethane coating also means the plates will grip the bar well and slide less during use. The heavy urethane coating surrounding the metal core helps to control impact vibration so that plates are less likely to bounce far if accidentally dropped and also less likely to damage unprotected floors or other equipment. American Barbell Fractional Plates are color coded and thicker than traditional metal fractional plates for easy locating, identification, and handling. Includes (2) 1 Kilogram Plates (2.0 KG total pair weight). Color: Green. Premium German urethane coating. Solid metal core is completely coated including center hole. Smooth, glossy finish. No odor. Stamped with kilogram weight increment for easy reference. Compatible with Olympic bars. Inside hole diameter: 1.999" to 2.001" tolerance. Plate thickness: 0.998". Outside diameter: 4.020"
Ader Olympic Fractional Plates 3/4 Lb Red Sold as Pair.